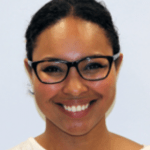 Congratulations to Dr. Diana Rigueur, who was awarded the First Place Postdoctoral Poster Presentation Award at the American Association of Anatomists’ 2018 Annual Meeting for her presentation, “Characterization of the FGFR2 M391R conditional knock-in allele: a model for Bent-Bone Dysplasia”. This prestigious award recognizes the best scientific poster presentation at the meeting by a postdoctoral fellow. Fight on!